On Jackie Robinson night the Dodgers seemingly battled themselves. In the series opener against the Reds, the Cincinnati Reds had five ex-Dodgers in the lineup at the same time. Yasiel Puig, Matt Kemp, Scott Schebler, Jose Peraza and Kyle Farmer were all in the lineup against Clayton Kershaw on Monday evening. 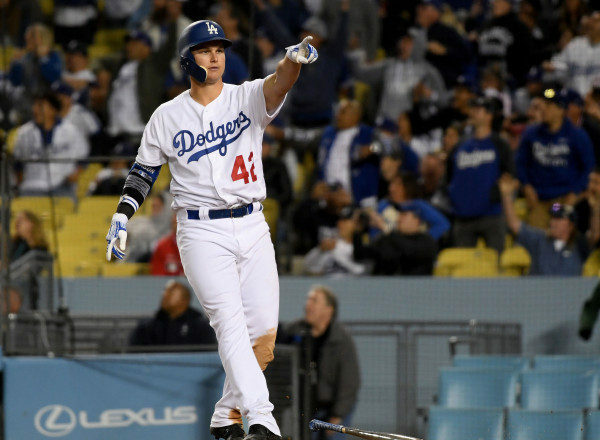 Despite Puig’s first inning homer, and Kemp’s ninth-inning go-ahead single, the Dodgers came from behind to win it when Joc Pederson smashed a walk-off two-run home run against Raisel Iglesias in the bottom of the ninth to win it for the Dodgers. There was a lot going on tonight at Dodger Stadium. Clayton Kershaw made his season debut for the boys in blue as he was activated off the injured list. There were five ex-Dodgers in the lineup for the Reds, and Cody Bellinger had to leave the game after getting hit by a pitch in the knee cap in the third inning. The Dodgers overcame all of that to come back and win it 4-3. Kershaw’s debut was a successful one. Other than giving up a two-run home run to Puig in the first inning, (of course) that was all he would allow. Kershaw allowed just two earned runs on four hits while striking out six without a walk over seven strong innings. He didn’t get a decision but his outing was encouraging. Even though his velocity was in the 90 MPH range, he mixed his pitches well and kept the ex-Dodgers off balance all night to keep the current Dodgers in the game. The Dodgers rallied for a run against opposing starter Luis Castillo in the bottom of the first. After Joc walked, Justin Turner singled him to third. Bellinger’s ground-rule double that short hopped the low wall in the right field corner scored one and cut the Red’s lead to 2-1. The Dodgers could have gotten more but A.J. Pollack and Max Muncy both struck out. In the bottom of the third inning Turner drew a one-out walk and then Bellinger was hit in the knee cap, knocking him to the ground. The Dodgers didn’t score that inning but Bellinger was removed from the game in the next inning and Dodger land held their collective breath. X-rays were reported as negative, thank god, but if the Dodgers lose Bellinger for any extended amount of time they are screwed. That is especially true with him leading the National League in almost every offensive statistical category. The Dodgers trudged along and tied the game in the bottom of the fifth. Singles from Pederson and Turner and a walk to Alex Verdugo loaded the bases. Pollack’s bases loaded walk forced in a run to tie the score at 2-2. Flash forward to the top of the ninth with the game still tied at 2-2. Kenley Jansen took the mound and Curt Casali led off the frame with a double into the gap. Kenley struck out Eugenio Suarez for the first out but Puig’s grounder moved Casali to third. Matt Kemp followed with a ground ball single through the infield into right field to give the Reds a 3-2 lead and send yours truly into a tantrum. After I finished breaking every single piece of furniture in my condo, David Freese led off the bottom of the ninth with a walk. Then Joc Pederson immediately followed by smashing a massive walk-off two-run home run into the right center field pavilions to win the game for the Dodgers. Thank god!!! Take solace Dodger fans, Bellinger’s x-rays were negative. Not only that, but the Dodgers home game streak with a home run has now reached 30 consecutive games. The series continues on Tuesday night as the Dodgers battle the ex-Dodgers and will give the ball to Kenta Maeda. The Cincinnati Dodgers, I mean Reds will counter with right hander Tyler Mahle with first pitch scheduled for 7:10 PM PST. Wow, ex-Dodger lineup roughs up Kershaw. 5 of 9 were ex-Dodgers. Also gave Jansen a scare. I was happy for both Puig and Kemp. 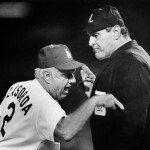 Reds jerseys should have had “ MENDOZA” on their backs, instead of “42”. 6 of 9 below 200…. perfect prescription for Kershaw’s first game of season after rehab. Dodgers’ sluggers continue to get beaned by the opposition. Dodgers have to send a message…. hit them first, not retaliate. Poor Belli will be hurting tomorrow. May be out a few days. X-rays negative. Another poor offensive performance…. 1-8 RISP, 9 LOB. Joc saves the day… he really needed that, as did his teammates. Jansen gets the win by default…. what a joke. Get it right, Scott. It’s the Cincinnati Dodgers against the Los Angeles Rays. Puig looks fatter than Joc these days. Joc finally gets it. The Bellinger incident was scary, but not premeditated. That pitch just got away from the Reds pitcher and he apologized to Belli. Head hunting is not a good idea. But that being said, few Dodger pitchers come inside much except Kersh. When he misses that target, as he did to Puig, he gives up the long ball. Muncy, and Pollock and Seager all were futile against Castillo. The playing everyday thing seems to be sapping Barnes bat. Since Martin went down and Barnes has had one game off, he is in a little slump. Muncy is striking out at a faster rate than last year and Pollock’s slide has lasted a couple of weeks. Seager to me is showing the rust and swinging at some pitches he would normally lay off of. SD loses, so they are 1 game back. Keuchel and Kimbrel are reportly lowering their asks during this free agency freeze. The Agents K.
I think they can be had for (relatively) rich 1-2 year deals, then they get to hit the FA again. Will Friedman pull the trigger? Wasn’t the whole point of getting under the threshold, to give us a chance to go over on short term deals like this? I would be absolutely ecstatic we get both for 1 year or 2 year deals. We have the money. But I admit this is not in Friedman’s genetic makeup and he will likely be out maneuvered. Hope springs eternal I suppose. Surprise (shock) me, Andrew! YF, I believe the mandate by ownership is NO LUXURY TAX. Either one would put them over, I believe. I would also love to see Kimbrel on our club but the only way would be to unload Jansen and I don’t see the FO doing that.